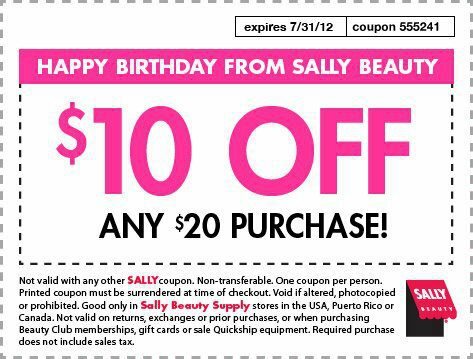 I have Sally's beauty Supply's July Coupon for you today. Thanks to a Lady called Lyndsey on PAA for this one. So Kind of you to share. Thank You soooooooo much for posting the coupon... I was just on my way there. Hope you got some pretty things. I thought these were only good to use once. Does the coupon number have an effect on the usage on it as well? These confuse me, any detailed info would be appreciated. The Online Code can only be used once (in most cases) by the person this was sent to. However, we all can print and take this to any Sally's store to use however many times we choose within the month it's valid. There are different coupons for each month, so when you print out the months coupon, take it to a sally's store and enjoy shopping. But there's no need. It's a coupon, printed online. There's obviously no online code in this particular one, but I chose to explain that (in case you see another one in another month that has an online code). SO that means, YES, you can use THIS particular one as much as you want within the month of July. Thank you for theinfo, Lizzy! I'm exited to use this one.